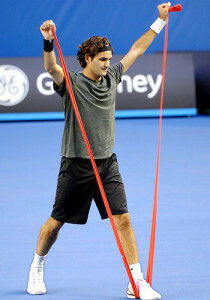 I am wondering what people think about the etiquette of jumping rope and similar warm-up activities on the tennis court. I belong to a club where I reserve my court time to play competitive matches, and I find that people jumping rope on the next court to be distracting. I know there are lots of distractions ... people shouting etc., but I think that if you want to do warm up exercise you should do it off the court. Am I way in the minority here?